--If you don't know what researching your ancestry has in common with convicting criminals or freeing the wrongly accused, you haven't been keeping up with genealogy. Swab your mouth. It's DNA. Professional genealogist Kathleen Brandt of Kansas City knows all about using DNA analysis to fill out family trees for paying customers. But she also helps people with more basic searches for free as a volunteer at the Midwest Genealogy Center in Independence. "Through DNA we can find a person's migratory path," Brandt said. "Did they come from Spain or a tribe in Africa? Are they Jewish or American Indian?" The process is simple -- a swab of the cheek is all it takes -- but it's not free. For less than $150 you can send your DNA to a lab. "From those results we do an analysis that gives us a genealogical fingerprint," Brandt said. "We can connect family trees to lineage societies, such as the DAR (Daughters of the American Revolution) and the Mayflower Society." "Much of (the information) is open and published," she said. "There's one service called Family Tree DNA. Most every test they've done is there for me, and I can tell whether you match anyone else who has done their DNA. It's become very popular in the last five years." But family historians can do numerous things for free. The first step, she said, is to take advantage of a researcher's dream built right here in our own backyard. With 52,000 square feet of resources, the Midwest Genealogy Center, part of the Mid-Continent Public Library system, is the largest free-standing public genealogy library in the country. The center has library staff and volunteers trained in genealogical research to help searchers navigate through the maze of information. They can access data from around the world, even order records from other countries. 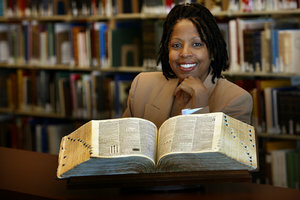 Library patrons also can get free access to subscription-based databases such as www.ancestry.com and www.footnote.com. More people every year are doing just that, said Midwest Genealogy Center manager Janice Schultz. In 2008, the library helped 87,000 users. In 2009, that number jumped to 106,000. This year Schultz expects the number to rise again. "The word is getting out," she said. "We can provide one-on-one assistance, help people when they hit a brick wall or if they don't know how to start. We also offer writing classes so people can learn to take those records they have been compiling and put them into a shareable format." It has never been easier to research your ancestors, thanks to another trend in genealogical research: the digitization of paper records. You used to have to rummage through land deeds and birth records in dusty old county courthouses if you wanted to unearth documents to unlock your family history. Not anymore. In fact, in August, one major database out of Utah -- www.familysearch.org -- digitized more than 200 million new records, bringing its free database of searchable records to more than 700 million. While family historians can search for their ancestors from their home computers, Brandt said, that's not the best place to begin. "Don't start with the computer," she said. "Start with what you know and come to the library. The first step is to get a beginner's package from the Midwest Genealogy Center and write down what you know about your family. It guides you through it like you're filling out a form." One caution, Brandt said: Write down only what you can prove. "That's the biggest mistake," she said. "Everything must be verified and cited." What you think you know could just be folklore or historical fiction. "That happens all the time," Brandt said. "I had one woman who wanted to prove that she was related to Johnny Mercer, who co-founded Capitol Records. She had been told that her whole life. But there was no proof, and she was very depressed. But I did give her a consolation prize. I found that she was a descendant of Irish royalty. That made her happy because she still had something to brag about to her husband." And there's a warning for bigots: Don't be too sure what color your ancestors were. "Mixed marriages were very well allowed in Virginia and North Carolina up until 1810," Brandt said. "So very few people are Â'pure.' Some are depressed when they find that out. And sometimes it's absolutely hilarious." Brandt, who makes a "comfortable living" after making herself into an expert through workshops, seminars and experience, gets clients mostly through word of mouth. Some also find her through her website at http://a3genealogy.blogspot.com. When she's not researching other people's families, she likes to discover things about her own. "I am an African-American, and on my father's side I was able to find slave-master information through Civil War records, because my father's side fought for their freedom," she said. Her mother's side? "They were never slaves, and owned land as early as 1817," she said. "One interesting thing about her side is that they were Irish." And how's this for interesting? "My father's great-great-grandfather was married twice, once with a slave wife and once after the Civil War with a legal wife," she said. "And when he died, his two wives fought over his pension." There's just no telling where genealogical research will take you.Henry Tharp, another Kansas Citian who volunteers at the Midwest Genealogy Center, even used genealogy to meet one of his favorite actresses, Jane Russell. "I was on a cruise (to London) with Jane last year, and prior to going, I read her autobiography," Tharp said. "She told a lot of stories in the book, and I thought there was no way it could all be true. So I did some research, and every bit of it was true." Tharp then compiled a binder of even more Russell family history and gave it to the former raven-haired bombshell, now 89. She was so delighted she gave him an autographed picture and even had lunch with him a couple of times. "You don't just walk up to a celebrity and say, 'Oh, I just love all your movies‚' " he said. "That gets you nowhere. I knew this was a more substantive approach and that she might enjoy it. And it turns out she did!" 9 a.m. to 6 p.m. Fridays; 9 a.m. to 5 p.m. Saturdays; and 1 to 5 p.m. Sundays. How could they not choose you? You are one of the best out there and such a brain-ee-ack! Thanks Dionne, Greta, Sheri for the stopping by and commenting.